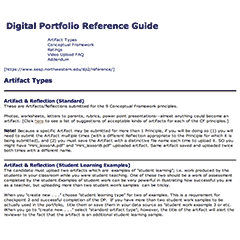 Digital Portfolio I/II were created as an extension of the custom CMS built for the School of Communication, Northwestern University, and rolled out to approximately 500 students/academic year in the MS Education program. 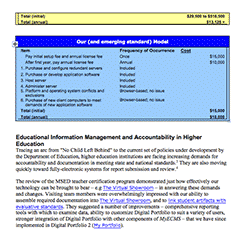 This was based on a policy of creating custom web apps rather than using off-the-shelf products: the School of Engineering's Computer Science program supplied a steady stream of talent to make this approach advantageous. 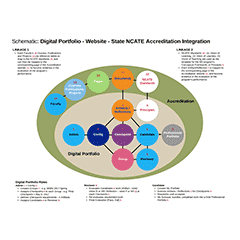 The Conceptual Framework was based on the standards created by the State of Illinois's accreditation governing body. 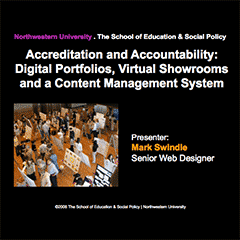 When the bi-annual review loomed, we launched a "virtal showroom," using not only the artifacts/reflections created by the students, but also the Profiles and Publications of the faculty as additional evidence the program was meeting guidelines. We were the first institution in the state to submit both electronic and paper artifacts.